Developing your B2B Email Strategy – The vital first step in ensuring success. It’s a single page of tough questions. You’ll need to boil down your answers to a single page, too. Content – Best practices for developing content B2B subscribers want to read and share. Strategies for driving engagement and click-through. Design – Proper design practices not only help get your B2B email opened but also maximize click-through and conversion. The Envelope – Getting and keeping the attention of B2B decision-makers and influencers is tough. Learn in-box and pre-header practices that survive delivery and encourage engagement. Analytics – Beyond delivery and opens. What you need to know evaluate your efforts, learn what works, and continually improve. Landing Page & On-Site Strategies – Beyond the click-through. Strategies for deeper subscriber engagement and leveraging B2B email content across other channels. Forwarding & Social Media – B2B purchases aren’t individual decisions; they’re influenced by multiple people and third parties. Learn tips and strategies for maximizing B2B social media sharing and visibility. Sending & Replies – Understanding when and how often to send. Developing a pre-send checklist. Establishing good reply practices. Sign-Ups & Auto Responders – How to minimize abandonment and start the relationship on the right foot. How to leverage auto-responders to drive deeper B2B engagement. Subscriber Relations & Subscription Management – How to nurture relationships with subscribers and encourage dialogue. Strategies for keeping subscriber data clean and accurate. Growing and Managing Your Subscriber Base – Strategies for building and maintaining a strong base of B2B subscribers, and segmenting subscribers and content. ISP Reputation Management – Best practices for maximizing delivery and minimizing risk. Please send me the eBook on B2B Email Marketing Best Practices, and send me an email when you publish other good stuff. An extremely thorough, well-organized and informative eBook with the wonderful and all-to-rare combination of comprehensive, valuable advice packaged in an easy to read format. One of the most comprehensive pieces on email marketing I’ve read in some time. There is no shortage of information and tips for B2B email marketing, but it’s rare to find so many useful and practical tips in one place. This eBook is truly a ‘one-stop-shop’ for best practices and strategies that every marketer should be using. This is the most comprehensive eBook on email marketing I have seen—it covers email marketing from soup to nuts! 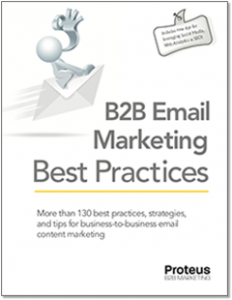 Reading this eBook is a fast path to a complete understanding of the best practices of B2B email marketing. As email plays a big role in B2B marketing and lead generation, I’m always looking for the latest information on how to improve B2B email results. So I attend lots of workshops and webinars, and read all the articles, how-to guides and books I can find on the subject. Yet, after spending less than an hour to quickly skim through B2B Email Marketing Best Practices, I came away with seven ideas I intend to put to work right away to get better results from my own, and my clients’, B2B email campaigns. Proteus B2B’s Email Marketing eBook is must read for any B2B marketer using email newsletters for lead nurturing. Though the eBook is incredibly thorough, what I love about it is how the content has been carved up into easy-to-read, digestible chunks. Even if you are an email marketing expert, you’ll walk away with several new ideas and great reminders.